What types of galaxies are in BOSS? A critical question for the SDSS-III BOSS is what kinds of galaxies are they observing. In a recent paper by Masters et al., SDSS-III scientists used additional, higher resolution data from the Hubble Space Telescope (HST) to answer this questions. In SDSS images, BOSS galaxies, which are on average about 6 billion light years away, just looks like fuzzy red blobs. The goal of BOSS is to observe 1.5 million of them over 30% of the sky in order to map the large scale structure in great detail. For this study, they took a look at a tiny subset of 230 of them which have deeper HST images (which were taken as part of the COSMOS project – the largest area HST survey every yet done). The study found that 75% of BOSS galaxies are massive ellipticals, but that a surprisingly high fraction (20%) of these are split into multiple components in the HST images. The remaining 25% of BOSS galaxies are massive spirals. 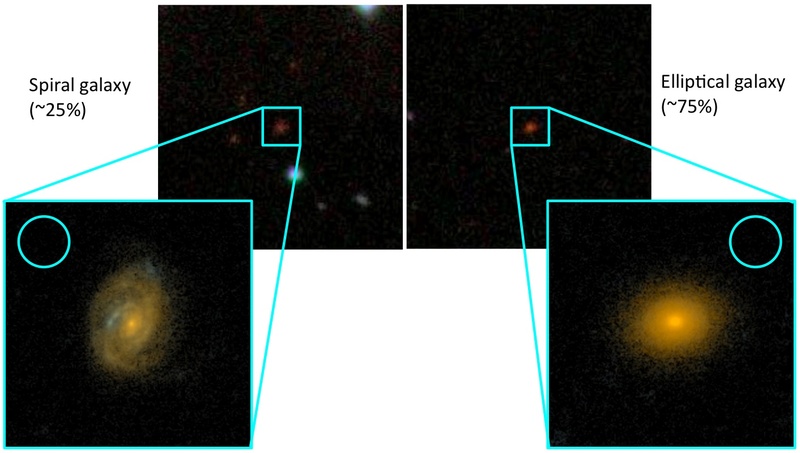 The image below shows an example of one of the spirals and one of the ellipticals shown in both the SDSS and HST image.